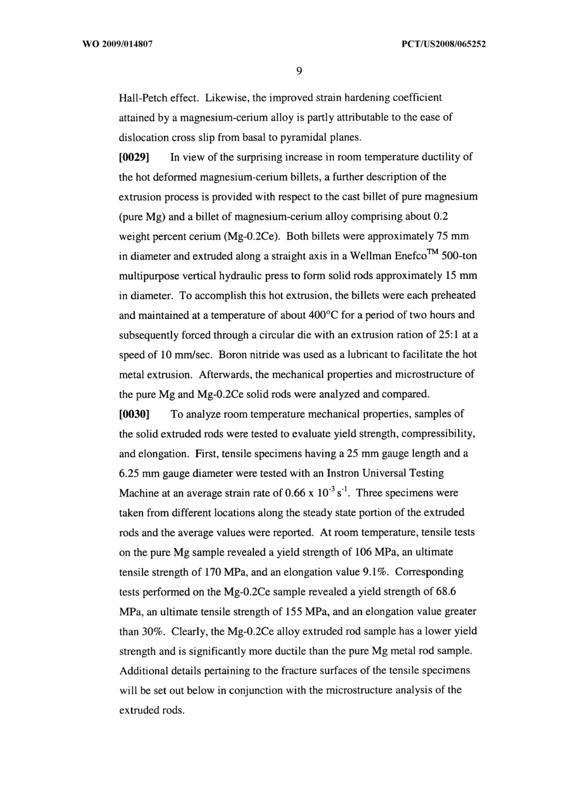 A magnesium alloy comprising up to about one weight percent of cerium may be hot worked to produce an intermediate or final alloy workpiec that exhibits enhanced ductility at room temperature. 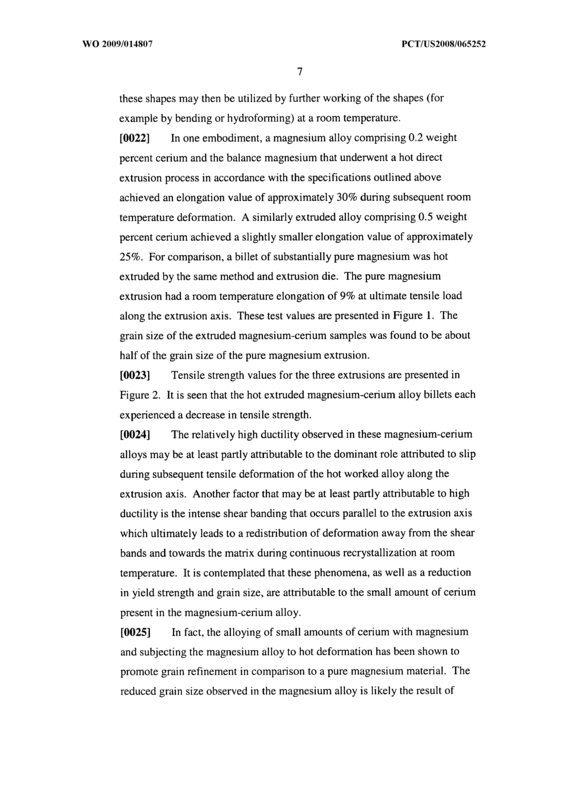 The addition of a small amount of cerium may affect the magnesium alloy by reducing yield strength, refining grain size, and improving the work hardening behavior. 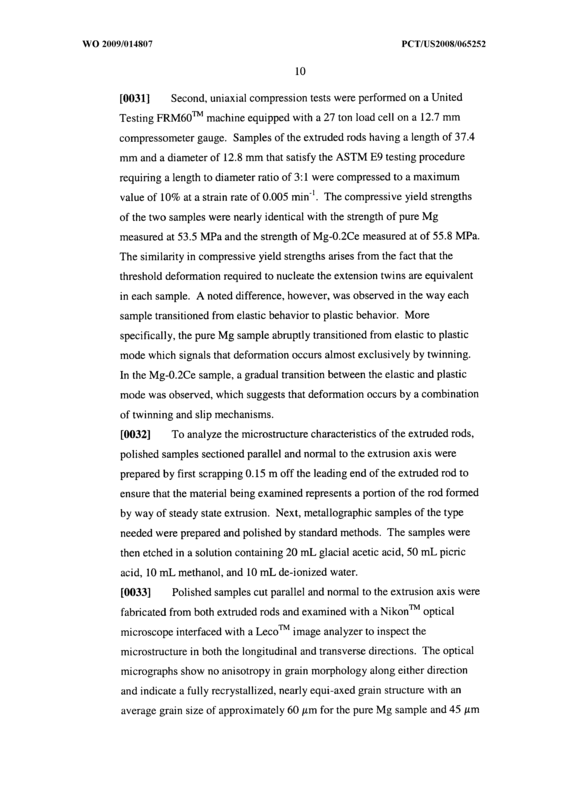 Recrystallization during hot deformation of the rare earth containing magnesium material alters the texture of the alloy and orients the grains in a manner that favors basal slip activity. 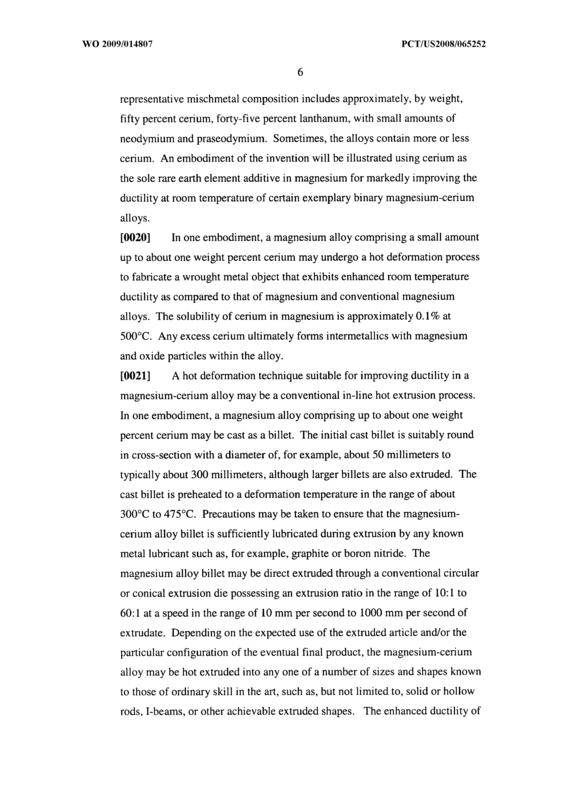 The alloy thus deforms at room temperature by a combination of twinning and slip mechanisms. 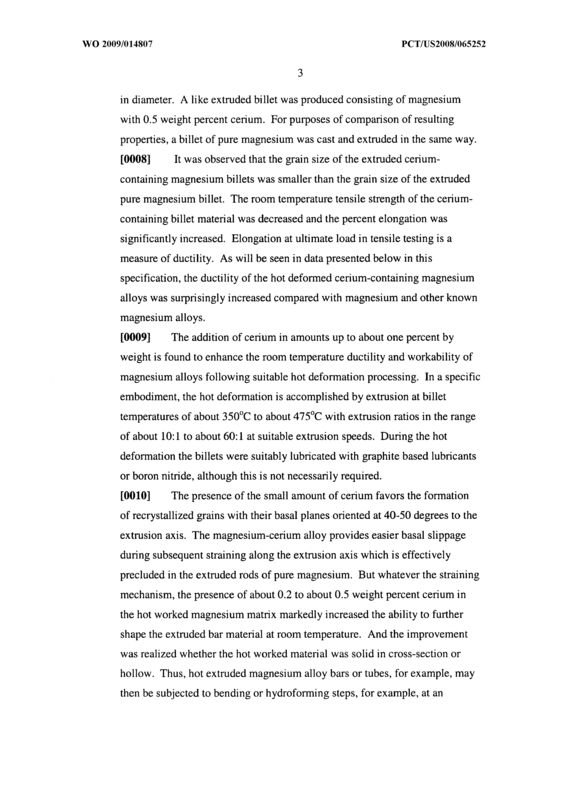 A method of processing a magnesium-cerium alloy to improve its ductility at room temperature, the method comprising: providing a magnesium alloy billet that comprises, by weight, up to about one weight percent of cerium and at least about eighty-five percent magnesium, the billet being shaped with an predetermined straight-line axis for hot deformation; and deforming the magnesium alloy billet along the predetermined axis at a temperature of at least 3000C to form a workpiece with greater room temperature ductility than a like-shaped billet of pure magnesium subjected to the same hot deformation process. 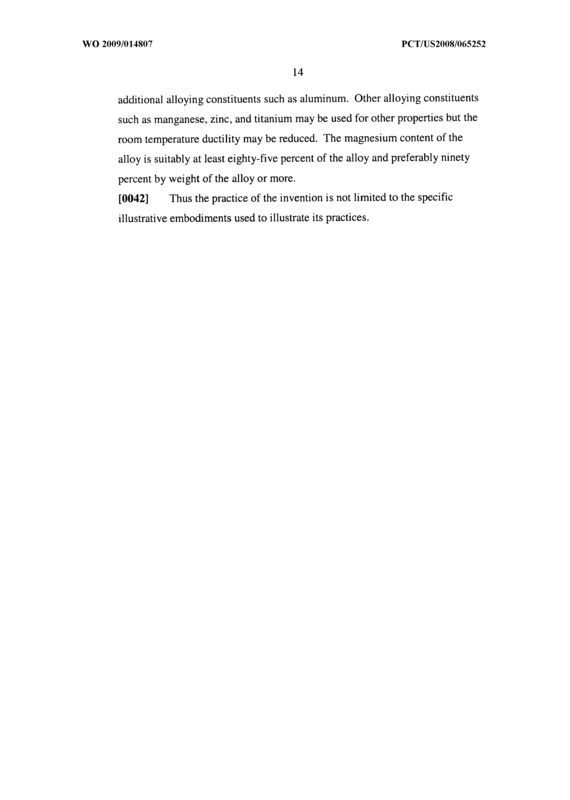 A method of processing a magnesium alloy as recited in claim 1 in which the deformed magnesium alloy workpiece is subjected to a further deformation step at a temperature below 3000C. 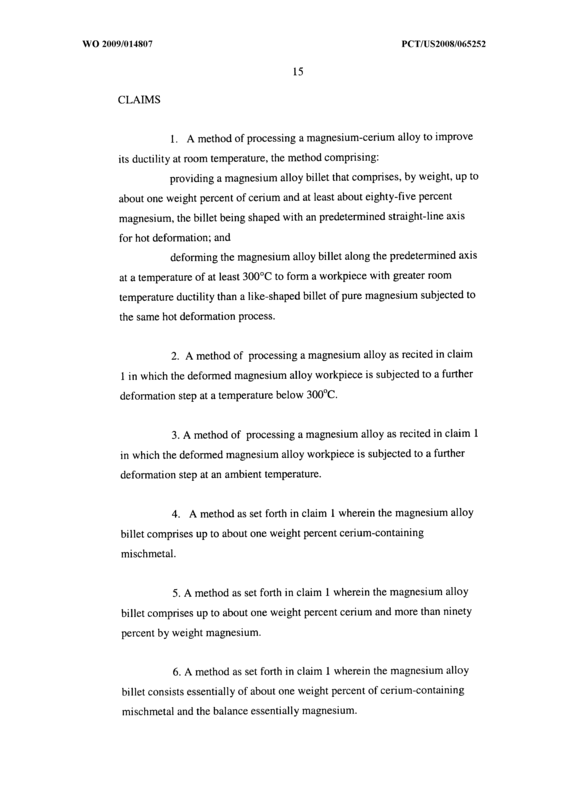 A method of processing a magnesium alloy as recited in claim 1 in which the deformed magnesium alloy workpiece is subjected to a further deformation step at an ambient temperature. 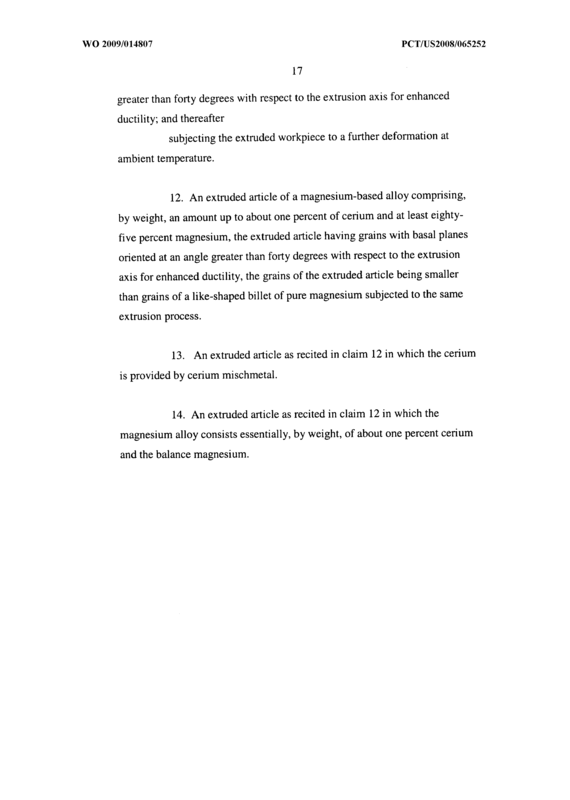 A method as set forth in claim 1 wherein the magnesium alloy billet comprises up to about one weight percent cerium-containing mischmetal. 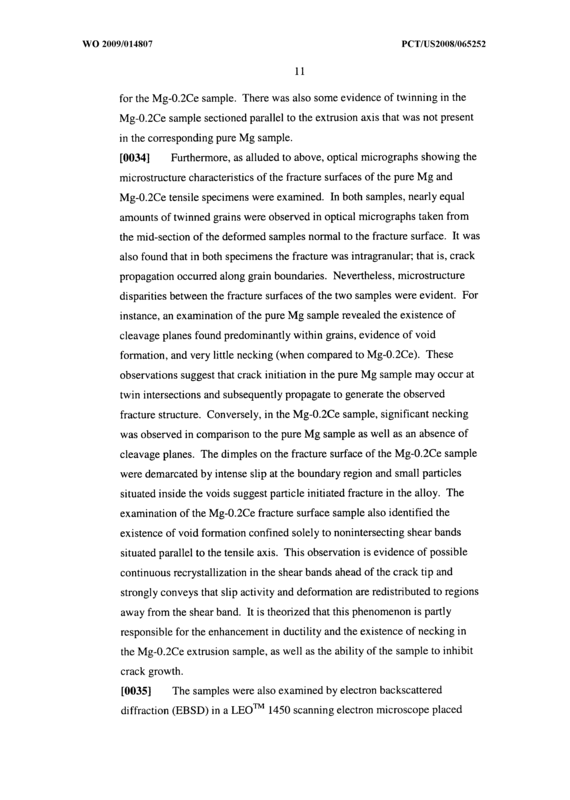 A method as set forth in claim 1 wherein the magnesium alloy billet comprises up to about one weight percent cerium and more than ninety percent by weight magnesium. 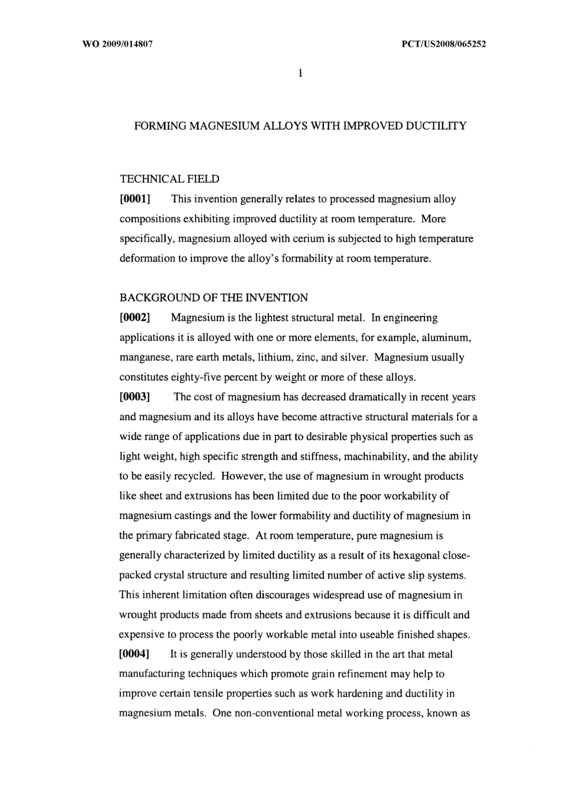 A method as set forth in claim 1 wherein the magnesium alloy billet consists essentially of about one weight percent of cerium-containing mischmetal and the balance essentially magnesium. 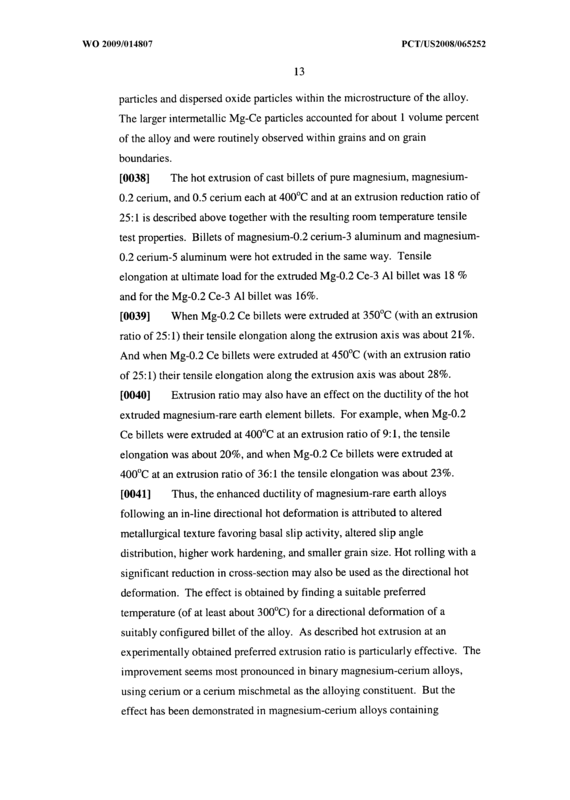 A method as set forth in claim 1 wherein the magnesium alloy billet consists essentially of about one weight percent cerium and the balance essentially magnesium. 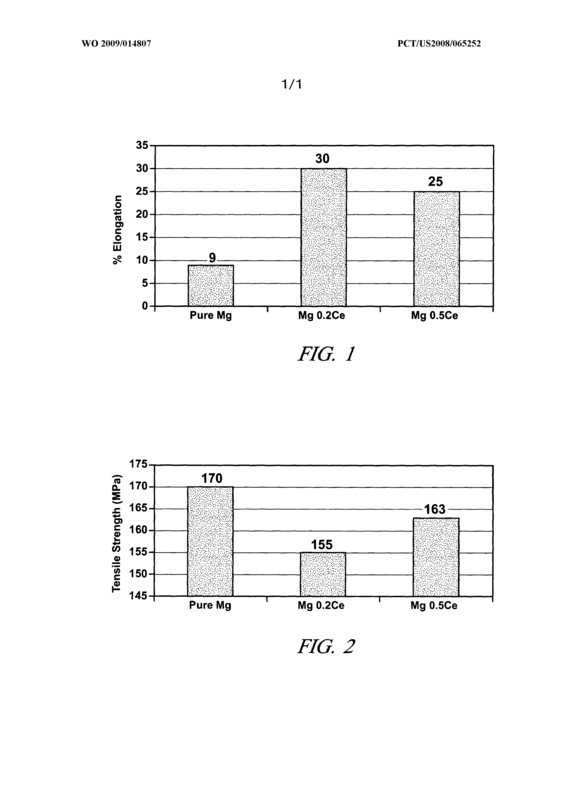 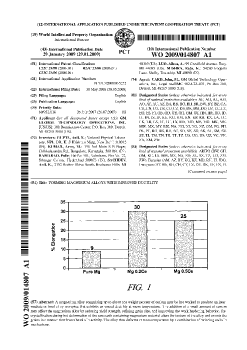 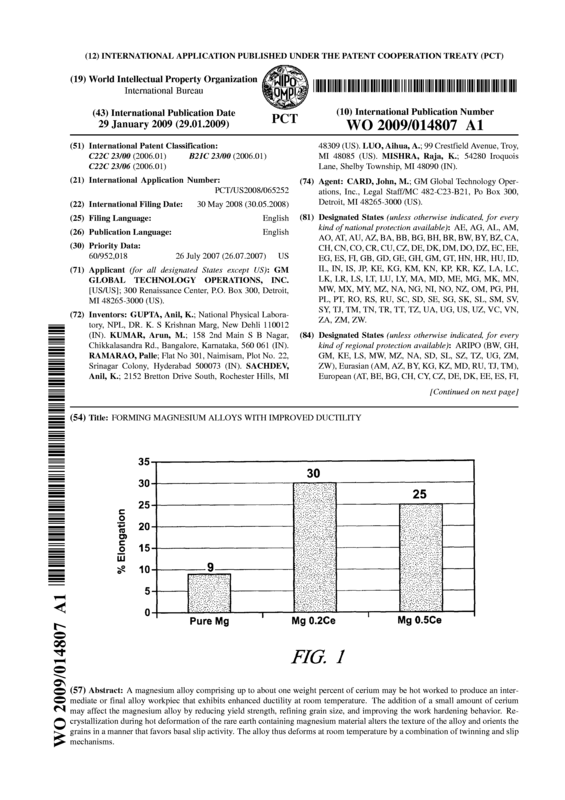 A method as set forth in claim 1 wherein the magnesium alloy comprises, by weight, up to about nine percent aluminum, up to about one percent manganese, and/or up to about three percent zinc. 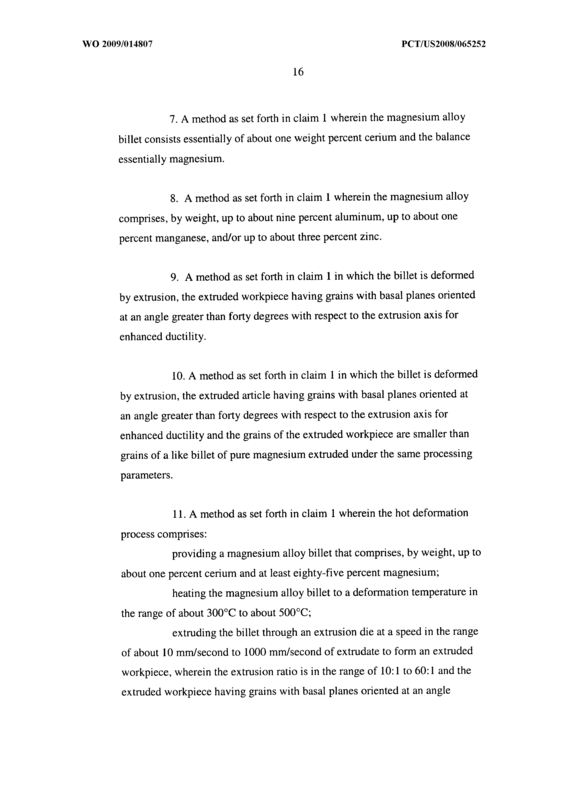 A method as set forth in claim 1 in which the billet is deformed by extrusion, the extruded workpiece having grains with basal planes oriented at an angle greater than forty degrees with respect to the extrusion axis for enhanced ductility. 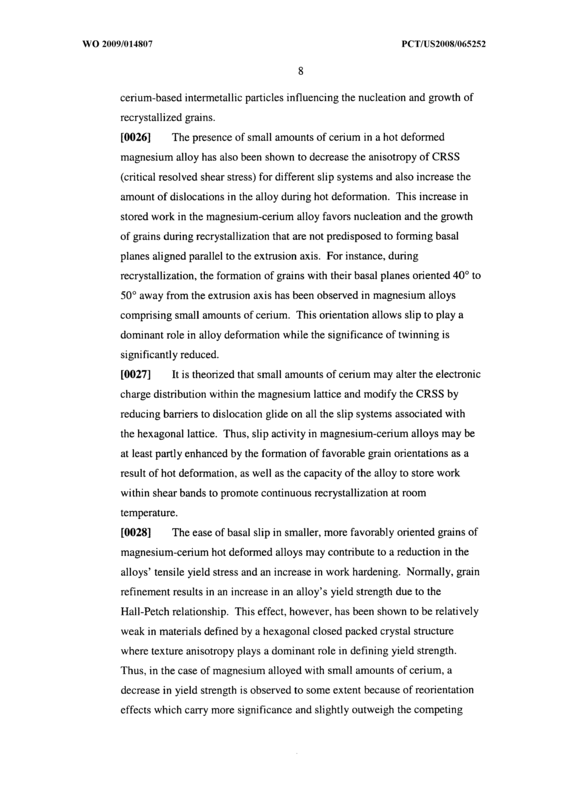 A method as set forth in claim 1 in which the billet is deformed by extrusion, the extruded article having grains with basal planes oriented at an angle greater than forty degrees with respect to the extrusion axis for enhanced ductility and the grains of the extruded workpiece are smaller than grains of a like billet of pure magnesium extruded under the same processing parameters. 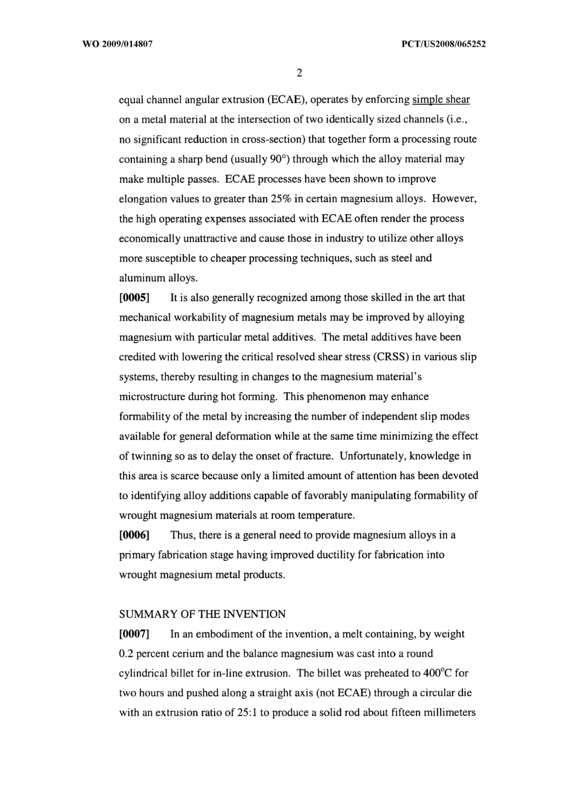 A method as set forth in claim 1 wherein the hot deformation process comprises: providing a magnesium alloy billet that comprises, by weight, up to about one percent cerium and at least eighty-five percent magnesium; heating the magnesium alloy billet to a deformation temperature in the range of about 3000C to about 5000C; extruding the billet through an extrusion die at a speed in the range of about 10 mm/ second to 1000 mm/second of extrudate to form an extruded workpiece, wherein the extrusion ratio is in the range of 10: 1 to 60:1 and the extruded workpiece having grains with basal planes oriented at an angle greater than forty degrees with respect to the extrusion axis for enhanced ductility; and thereafter subjecting the extruded workpiece to a further deformation at ambient temperature. 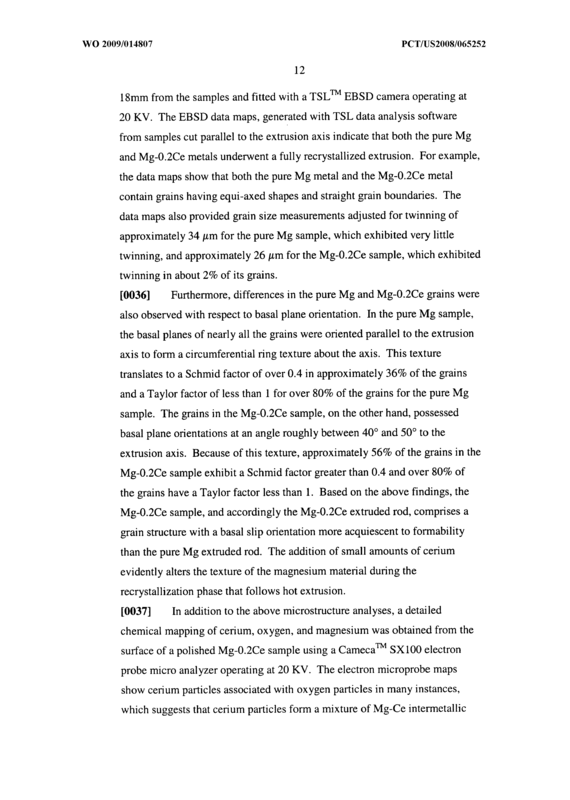 An extruded article of a magnesium-based alloy comprising, by weight, an amount up to about one percent of cerium and at least eighty- five percent magnesium, the extruded article having grains with basal planes oriented at an angle greater than forty degrees with respect to the extrusion axis for enhanced ductility, the grains of the extruded article being smaller than grains of a like-shaped billet of pure magnesium subjected to the same extrusion process. 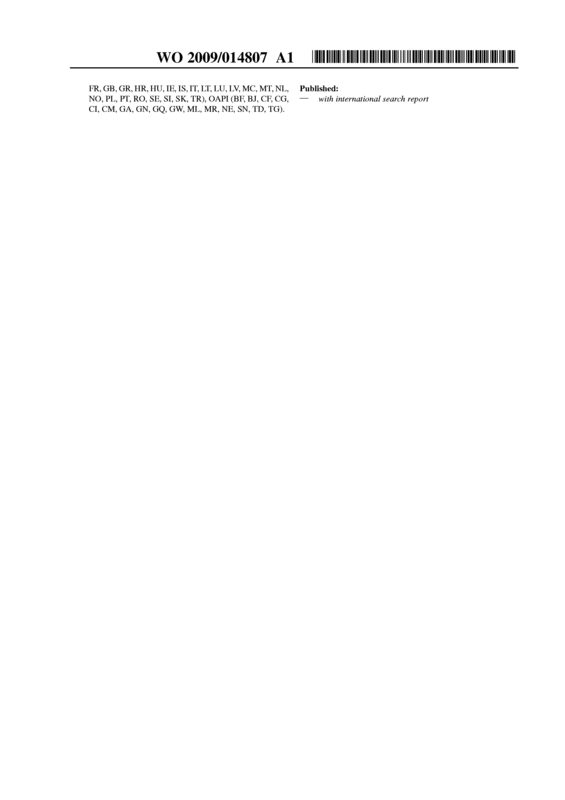 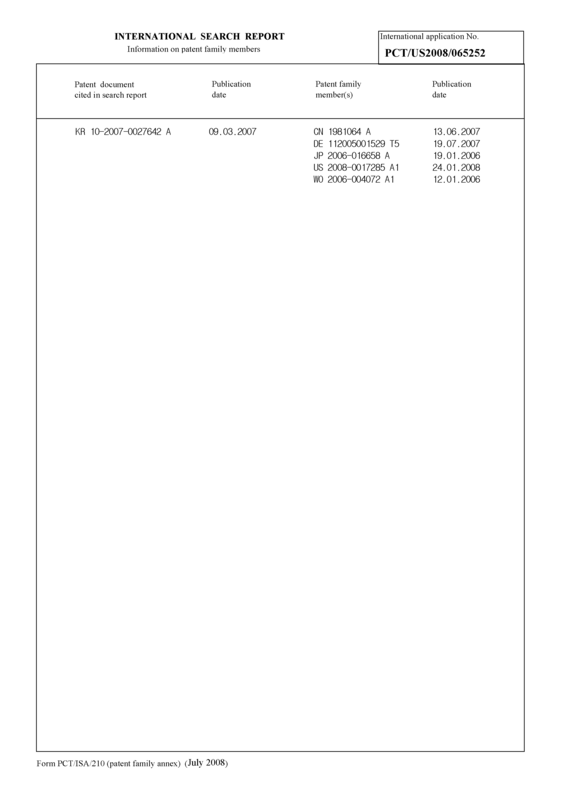 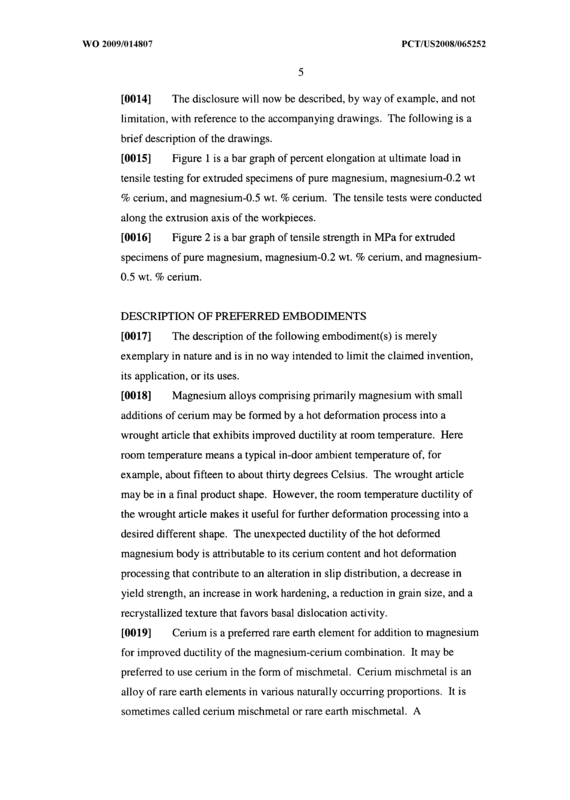 An extruded article as recited in claim 12 in which the cerium is provided by cerium mischmetal. 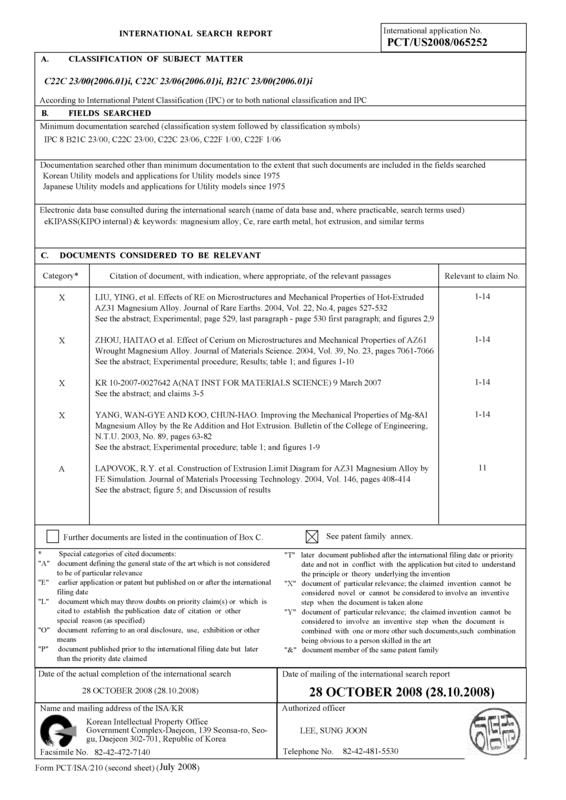 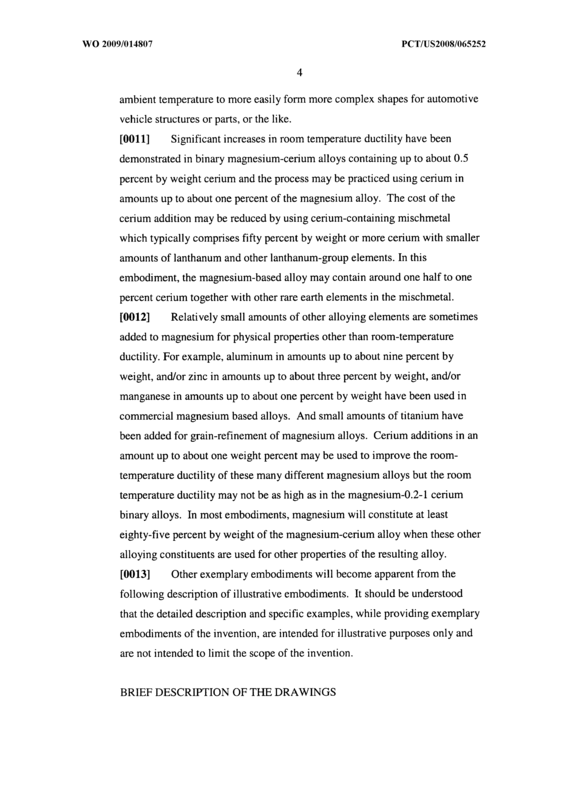 An extruded article as recited in claim 12 in which the magnesium alloy consists essentially, by weight, of about one percent cerium and the balance magnesium.